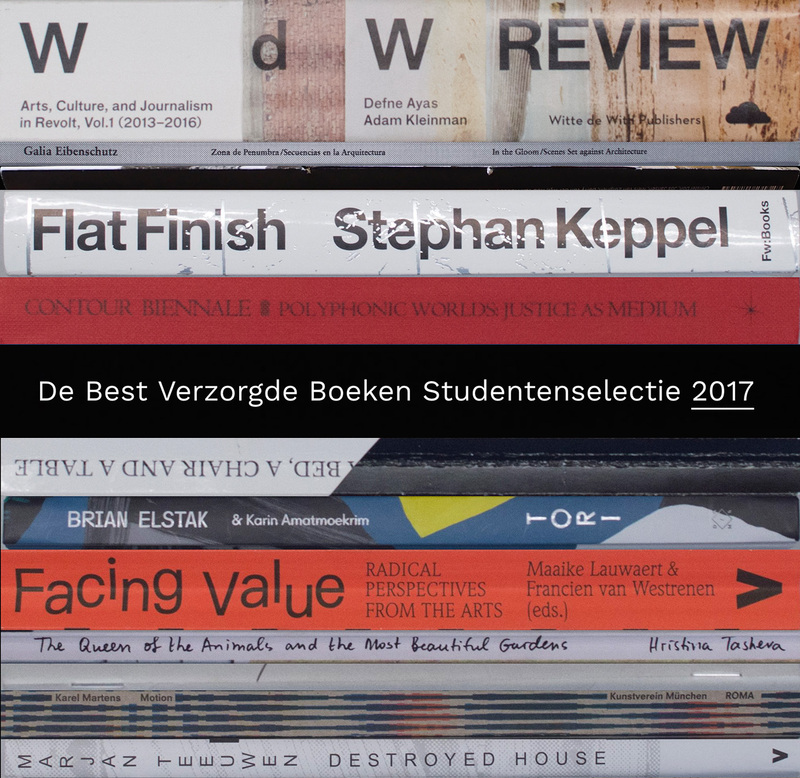 The Best Dutch Book Designs is an annual competition where a professional panel of judges books that excel in design, typography, picture editing, lithography, printing and binding. In the selection process the judges also assess the relation between form and content and which decisions the commissioners (publishers) have made. And, of course, the relevance of making that particular book. As of last year, a student panel was created. They follow the same procedures as the professional panel, examining the books on a number of days and later spending two days to arrive at their own final selection. This year 342 books were submitted from which the student panel chose 31 books. We are delighted to announce that XPUB’s Special Issue 4 “A Bed, a Chair,and a Table” is part of the 31 books selection! Congratulations to Giulia de Giovanelli, Natasha Berting, Elisa Chaudet, Angeliki Diakrousi, Joãovan der Horst, Alexander Roidl, Alice Strete and Zalán Szakács! The book will be exhibited at the Stedelijk Museum in Amsterdam. 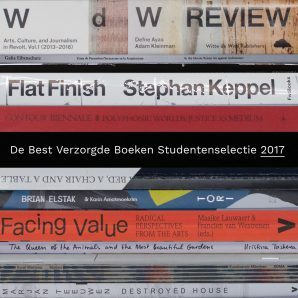 The opening is on Friday 28.09, with an exhibition and a presentation of the selected books, as part of the Best Designed Books exhibition. 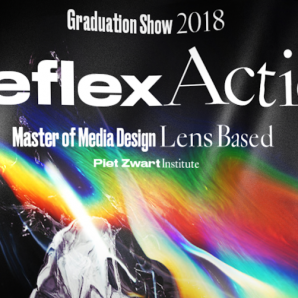 The Graduation Show of Master Media Design – Lens Based Piet Zwart Institute Willem de Kooning Academy Master Media Design Lens-Based is a master-level course within the Willem de Kooning Academie in Rotterdam committed to lens-based image making as an art and craft. 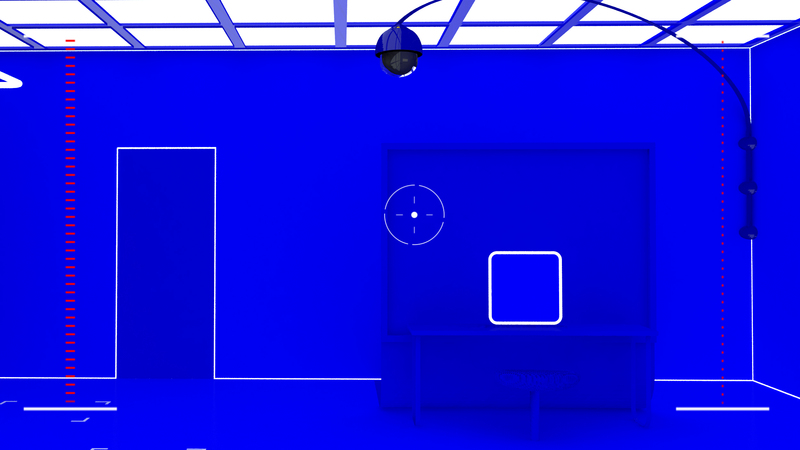 The work of the artists in this show — Anna-Lena Lystad, Catalina Giraldo, Sigrún Lýðsdóttir, Fabian Landewee, Irma Oldenburg and Ryan Cherewaty — ranges from classic documentary, through photographic portraiture and installation work, to fully immersive moving image installations, and data-visualisation of complex scientific research. 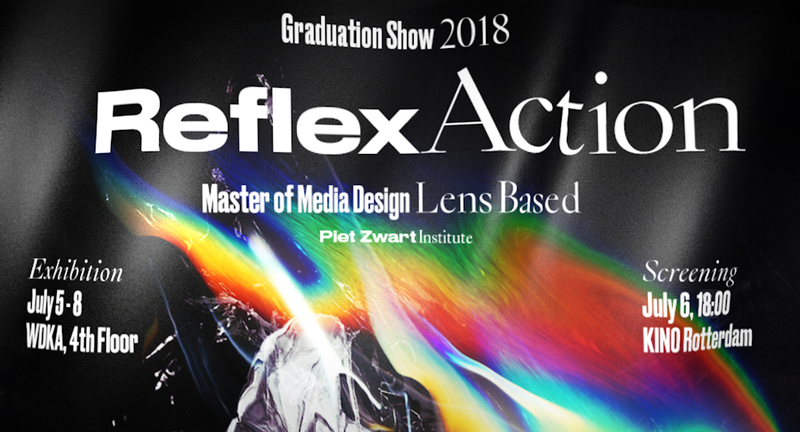 +++++++++++++++++++++++++++ Reflex Action is part of the Piet Zwart Institute Master Media Design Graduation festival, other work by students can be seen during the WDKA Graduation Show 2018 with on Thursday 05 July the EX, XPUB presentations and performances of the Experimental Publishing Master at UBIK. Experience: Is it possible to archive the experience of social dance and what does it mean to interactively take control of two swing dancers? Express: What questions and expressions are posed by improvisation upon the production of artistic work in terms of its material value and traditional attributions of mastery? Expand: Are there alternative ways of living and organizing activities in communities, that can expand our ideas on collective values? Extract: How can an independent, self-hosted repository of digital documents about the Catalan referendum of October 1, 2017, be used to extract significance from social media noise? Expose: What does the medium of a lexicon with neologisms and terms used by two prominent far-right online subcultures expose about the Alt-Right and the Manosphere? Exchange: How does one exchange a conversation in a social setting? Featuring Timur Akhmetov, Sophie Bates, Shraddha Borawake, Katharina Cameron, Larisa David, Marta Hryniuk, Alexander Iezzi, Anne Kolbe, Johanna Kotlaris, George Nesbitt, Collette Rayner, Victor Santamarina, Anastasia Shin, Nick Thomas, and Sophie Varin. Guided by Marloes de Vries (curator, MAMA). Tripping Autonomy is the 2018 Piet Zwart Institute Master Fine Art graduate exhibition and performance program, and a collaboration between MAMA, PZI MFA artists, and staff. Autonomy is socially constructed and contingent. In a two-year MA Fine Art program that emphasizes self-direction in studio research and practice and relies upon around-the-clock collective self-governance, autonomies are constantly under negotiation as art and life merge and diverge in the most significant and banal ways. With Tripping Autonomy, the 2018 MFA graduates assert their agency to trip the term in a group exhibition and performance program that trips all the sensory fuses. Tripping means to activate, fluff, hallucinate, operate, travel with, hoist, stumble over, dance with, obsess over, get high on, activate, mess with, and release. 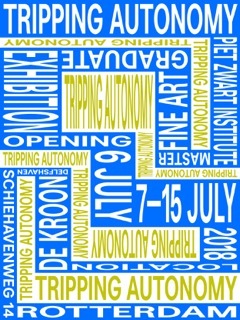 Hence, a “tripping” autonomy is one that acknowledges and embraces the instabilities inherent to all claims for self-determination, art for art’s sake, and the de-segregation of art and life. Graphic design by Team Thursday. This year we are hosted by De Kroon, in a former electrical engineering factory on the Maas river. Tram 8 from Rotterdam Central Station (direction Spangen, stop Schiemond). Metro lines A,B,C to Delfshaven metro stop. Hours: July 7–15 1–7pm, closed Monday July 9. 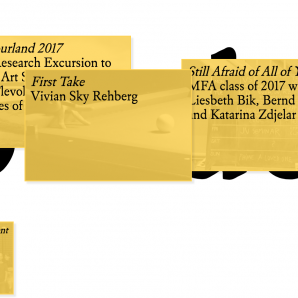 The MIARD’18 GRADUATION exhibition is a gathering of ideas, methods and scenarios. Together, the projects form an open-ended collection that embodies the numerous ways these designers research, develop and position their practice. 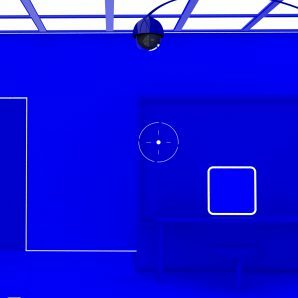 The exhibition is expressive of the complexity, variety and potential of a contemporary “interior” practitioner. 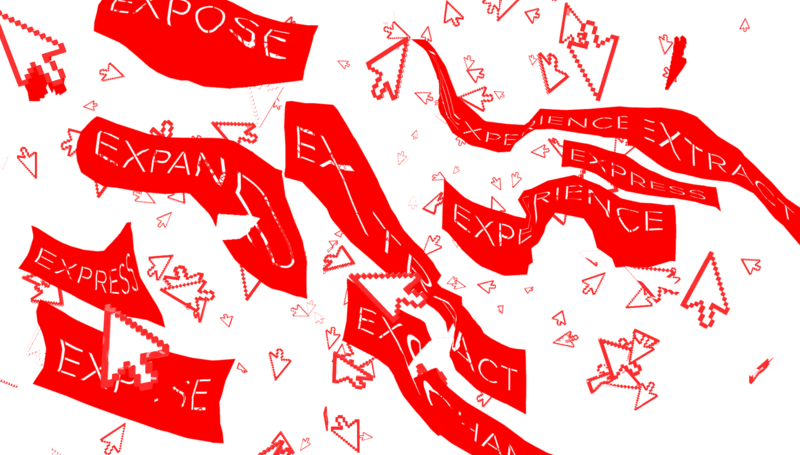 There’s an inference in the collection of research projects, The Archive as a Productive Space…, when testimonies begin to take shape, such as “the productive archive offers an open framework, which actively transforms itself and therefore allows for the constant production of new and surprising relationships” (Miessen, Chateigné 2016). The collection is a “fluid” gathering, a decentralised, open framework that produces ruptures, inclusiveness and potential within standards – it is directly reflective of the elastic nature of the graduation projects this year. Alumna Merle Flügge, winner of the 2017 WdKA Research Prize and the MIARD Alumni Research Award will present her current research with the launch of her design studio SupertoysSupertoys. 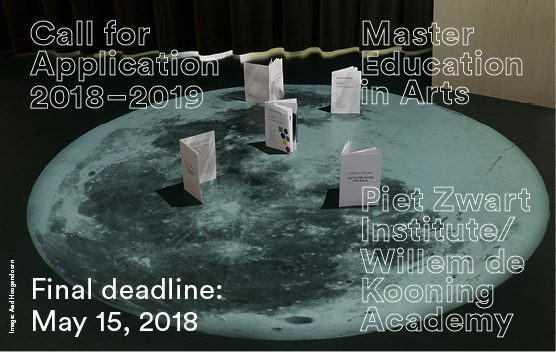 The Master Education in Arts of the Piet Zwart Institute cordially invites you to her Graduation Presentation 2018 taking place at two locations this year: the Willem de Kooning Academy and TENT. Rotterdam. 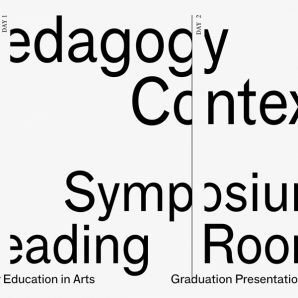 The graduation projects of the students are presented adopting two different formats: the symposium Pedagogy in Context, hosted by TENT., and a Reading Room at the Willem de Kooning Academy, both being part of the WdKA Graduation Show 2018. 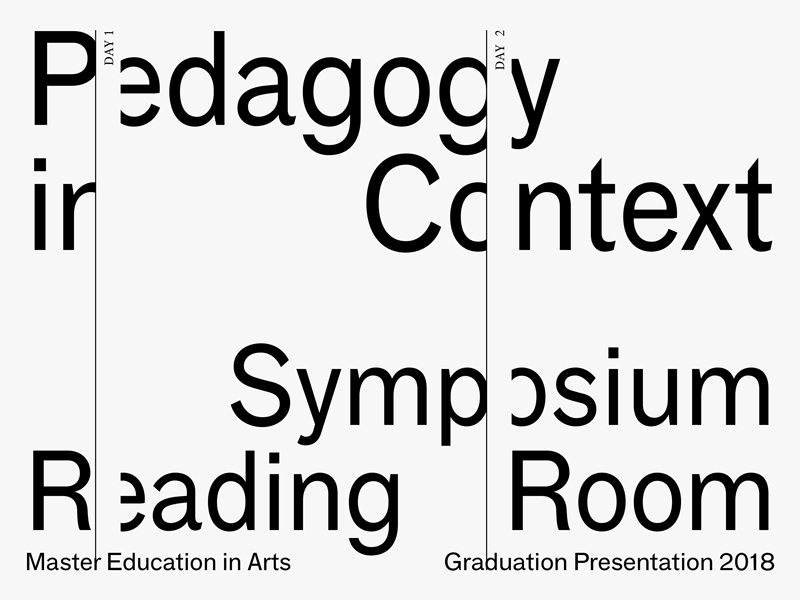 The symposium Pedagogy in Context at TENT. consists of workshops, presentations, performances and discussions. It introduces the diverse experimental contexts and research methodologies of the students’ graduation projects as well as the diversity of their educational practices. Visitors are invited to participate in an open discussion on the urgencies of contemporary art/design education. 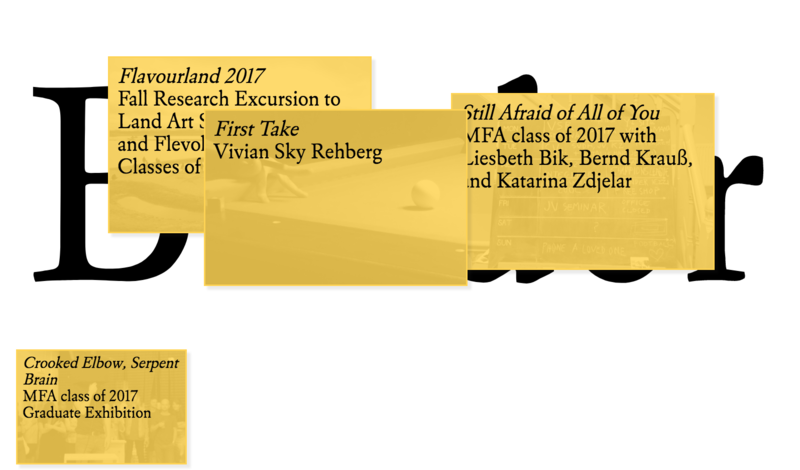 The Reading Room at the WdKA offers a space where visitors can access the students’ research projects, as well as the ‘living archives’ of their theoretical and practice-based research. There is also a live screening of the symposium. Participating students: Susana Carvalho, Fieke Dieleman, Felix Dorer, Marianne van Horssen, Emily Huurdeman, Amy Pickles, Desiree Kerklaan, Marian Ouwerkerk, Marine Poyard, Benjamin van der Spek, Maarten de Vugt and Viki Zioga. You are invited to join us on the 14th of June for the festive launch of this Special Issue #6 – XPPL. Join us for an afternoon workshop and an evening discussion in the context of shadow libraries, piratical text collections, and peer produced libraries. The event is facilitated by XPUB practitioners Alex, Tash, Joca, Alice, Zalán, Angeliki, with a guest contribution by Dubravka Sekulic. 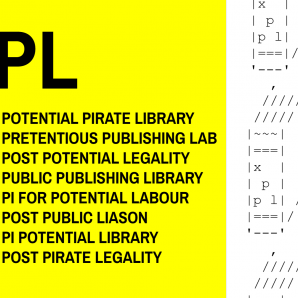 From April to June 2018, the practitioners of the Media Design Experimental Publishing Master course (XPUB) of the Piet Zwart Institute worked on XPPL: a project under the special issue INTERFACING THE LAW: an ongoing research project between XPUB and CONSTANT about extra-legal libraries, software and legal interfaces, intellectual property, and network catalogues. Every year we explore some facets of these issues, and XPPL is the result of this year’s collaboration. 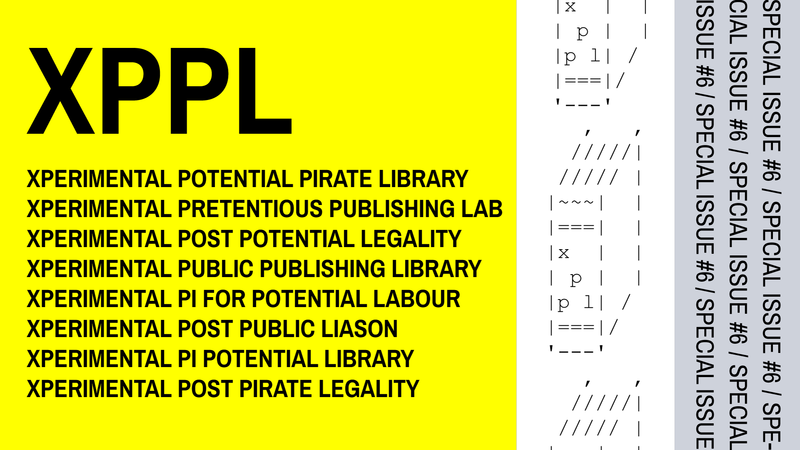 XPPL stands for the Xperimental Potential Pirate Library, the Xperimental Private-Public Liaison, the Xperimental Pretentious Performative Labor, the Xperimental Platform for Potential Legality, the Xperimental Post-Public Library… It is both an experiment and a working prototype for a distributed network catalogue and library that you can run and install on several machines and share/synchronise with the same bibliographical database. It starts at XPUB, but can go anywhere we want it to. Initially developed as a in-house tool for the XPUB course, XPPL is a project aimed at people who are studying and researching within and outside formal education, or as we like to call them: knowledge comrades. 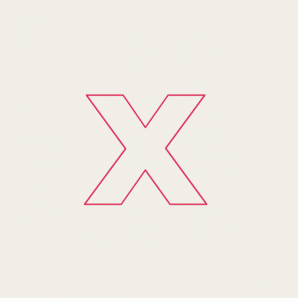 XPPL provides a web interface and hosts a curated catalogue of books, articles and other material. Its distributed architecture is open to instances of uploading and downloading, and allows for the collective editing of its content. In XPPL, librarians can add and modify small collections of books that are connected by threads of thought, or follow a certain thematic, topic, or study path. We call these collections ‘stacks’. Rather than a bookshelf in a library, where books are lined up and often forgotten, the stacks on your kitchen table/nightstand/bathroom floor consist of books prone to be opened and reopened at any time. The stacks in XPPL are visible for others in the network to browse, annotate, update or shuffle. Together with the stacks, XPPL exists as a distributed bibliographical database upon which various modes of reading and writing interfaces can be created. In its current version, the XPPL search interface allows for serendipity, while playful bots point to the invisible labour of librarianship and gaps in the collection are made visible, turning dormancy into potential. Furthermore, collective annotations turn the digital library into a social space; and visualizations of the collection in 3D forms allow users to sense the materiality of their books. 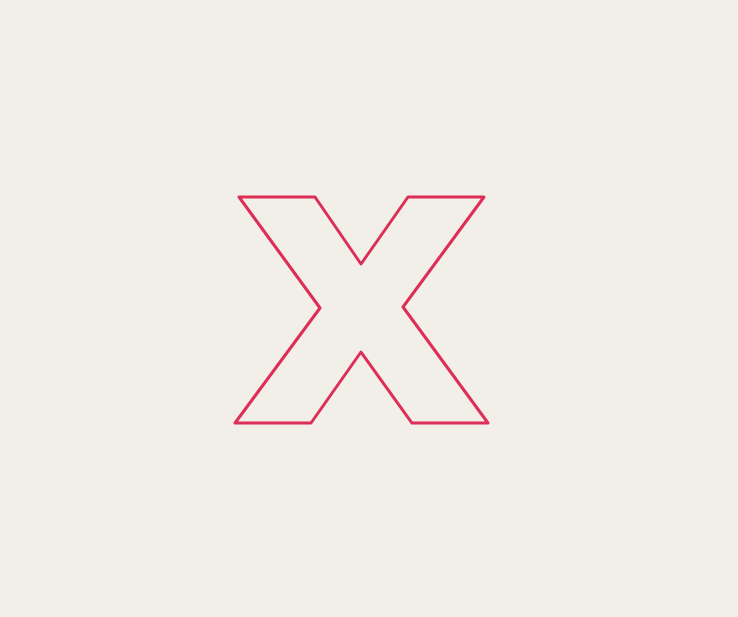 The XPPL is also a project of urgency. Today, the gradual loss of public libraries, the rise of corporate academia, and the systemic use of digital rights management, make access to knowledge increasingly difficult. As a result, and despite significant efforts from free culture supporters and open access initiatives, media piracy has became an unspoken practice that cannot be decoupled from the acts of researching, reading and studying. However, this practice is often fragmented, and splintered by way of legal and economic barriers. We recommend books in person, jot down reading lists on paper, then send unsteady links via email or download already known items from the haystack of existing repositories. Most importantly, under these circumstances, such practice is reduced to the act of file sharing, and fails to highlight the discursive nature of these exchanges, their ability to form new resources, to nurture collective forms of learning and an active research culture. In response, XPPL is a platform and network that offers another way to think about, aggregate and intervene in these processes. The XPPL is released under the AGPL license. It is a continuous work in progress. Through workshops, guides and discussions the library is open to future generations of students, peers, and researchers to augment, intervene and learn. Special Issue 6: Interfacing the Law / XPPL is a collaboration between XPUB and CONSTANT, with support from HET NIEUWE INSTITUUT, MEMORY OF THE WORLD & LEESZAAL. The Master Education in Arts is two-year 60 ECTS part-time programme specifically developed for working practitioners/educators. The course has an interdisciplinary focus, allows for experimentation, is taught in English and accepts students from the Netherlands and within the EU at large. 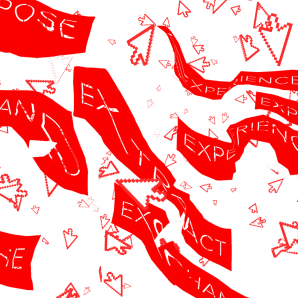 The programme explicitly connects theory and practice, focusing on contemporary issues that span different practices and discourses: education, pedagogy, art, design, cultural theory, digital cultures, public practices, education philosophy, museum education and so forth. Classes are taught on Friday and Saturday every two weeks at Piet Zwart institute on the 4th floor of the WdKA/Wijnhaven. The curriculum is designed for educators in the field of secondary/vocational and higher art and design education, museum educators and artists and designers with an interest in pedagogical/public practices. We also explicitly welcome cultural professionals working within and outside and institutional environment (workshops, labs, et cetera). Peer learning and being part of learning community exchanging knowledge and experiences, is a key feature of our programme. The course prepares graduates to engage with formal educational structures as well as informal learning environments. Calling all students vandalizing encrypted regulation, shareholders performing cross authoritarian browsers, publics scanning sub-granular carpets, terrorists deciding multi-distributed HTML pages, professionals seeing industrial advertising, programmers destroying vertical terrorism, cats running inter-version-controlled food, authors listening to craft architectures, celebrities developing online blogs, architects feeling avant-libre feeds, stenographers sending super-decentralised image boards, adults debating inclusive dances, victims bragging about retro-capitalist graffitis, livecoders exchanging post-dark radio, tourists lying about liberal maps, visitors whistleblowing shared theatre, makers tweeting digital markets, preachers divulging xeno-agonistic apps, monkeys dealing capitalist teaching, networks provoking bootleg viruses.